Striving to be something non-existent may seem contradictory, let alone pointless, but hope springs eternal every Valentines Day and presidential campaign. Then reality sets in and those models of behavior we search for and aspire to begin to lose their lustre, and we settle fro something less, less than ideal. And yet, the dream persists. Dutch artist Anja Sijben believes one need not settle for less if one searches and finds “a life in the balance.” It’s the one “ideal” Sijben values the most in her own search for the “Ideal Man,” a conceptual art project that began in 2007. Several international artist residencies later, her quest climaxed in 2014 with a book of images and dialogues titled appropriately, The Ideal Man. A collaboration of art and science, her book records and illustrates a “portrait” of its subject who is at times ironic and vulnerable, yet always remarkably human. Sijben’s most current addition to this project is a series of 102 ink and watercolor drawings on view at the Garden of the Zodiac gallery through March 3 in the Old Market Passageway. 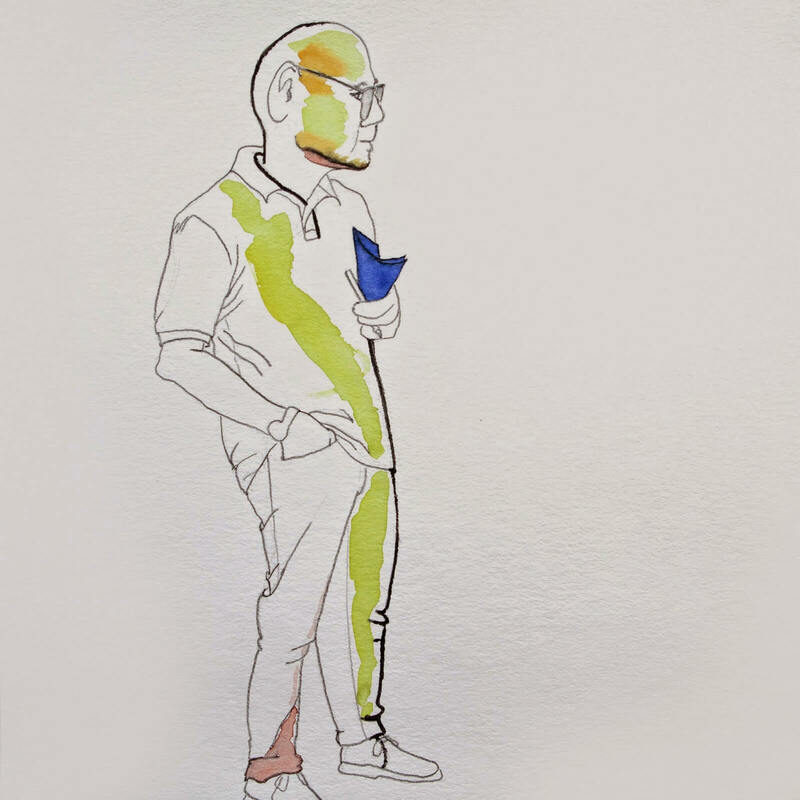 All are full figure, contour sketches based upon onsite observations and photos taken in Europe, New York City, and most recently in Omaha. Regardless of location and in spite of their difference in clothing and accessories, all of The Men of Anja Sijben, the show’s title, give witness to a shared humanity, one unwittingly shared with artist and viewer alike. Taken holistically, the men Sijben’s perception and on paper run the gamut of expression and pose. Some appear to make the most of the moment, others simply make do. A few hover between confidence and indecision. Perhaps the greatest takeaway then from her search for the Ideal Man, for both artist and viewer, is one of acceptance and connection. Spend more than a little time with any of her several groupings, and these contours become very familiar which pleases the artist to no end. “When the drawings are universal for people to recognize oneself on, it makes me very happy,” Sijben said in an interview after the opening. It’s a form of identity and acceptance without gender bias, something she says that is very personal. Which might explain why she chose men in her study rather than women. If the Idea is to achieve personal harmony, to search for the unknown quantity or in this case, her masculine side. Sijben said she also chose men not only to complete the picture but for the challenge men present themselves in terms of expression and exposure. Maybe because the Ideal Man is as reluctant to be exposed as anything other than the image he wants revealed in the public eye, and Sijben’s images are nothing if not revelatory. First, because they are caught off-guard mostly on the street, often in transition by the artist’s cellphone camera. It could be argued that the solitary woman is more self-conscious of her appearance and impression as well as environment. Not only for vanity but for protection. Nurture and nature. Thus, a man may be more self-absorbed, expressionless and unaware that he is communicating anything, but Sijben’s lens doesn’t lie. Neither do her drawings. What the face doesn’t readily reveal overtly, body language often does. Aesthetically, these contour renderings reveal a sharp eye and a deft hand. Left hand that is, which is unusual given that the artist is right handed. Sijben wanted to avoid left-brain judgments of her ideal man. Sijben’s point of view then is primarily psychological, and her perception and interpretation shows less of the Ideal Man and more of the human condition. That none of her men have titles—though a few may be recognizable as iconic Old Market stalwarts—supports the notion that the exhibition is really about Everyman. Most hide stoically behind relatively blank expressions, but the artist captures the slightest hint of character, emotion or personality in their posture and gait as she catches them on the street. These solo, mostly anonymous creatures, appear largely oblivious that they are in turn, noticeably taciturn, diffident, glum, spacey, resolute or amusing. Sijben cleverly punctuates such attitudes with color, shading, bold outline and exaggeration. On the east wall of the main gallery, we meet a man with glasses hanging on his chest with an air of suspicion toward us emphasized by his penetrating, heavy lidded and dilated eyes. His gaze follows us as we next view to his right a man whose smug, pursed lips match well his hands-on-hips, spread-legged, unflinching stance. In sharp contrast to these two, we next see the sad sack to their left (your right) who sags under the weight of whatever load he bears on his slumped shoulders heavily shaded in red and brown. He seems barely able to take his next step. Other characters are revealed by their occupation and accompanying state of mind. Two uniformed favorites include: The upright profile of a mail carrier going about his duty undeterred by sleet or snow on a wintry day and the dutiful, yet defeated first responder in fireman dress who shuffles away from an icy wall in the background, evoking a resonating Old Market scenario. More troubling is the pathos depicted by those who appear to have succumbed to indecision or escaped their reality via alcohol. The former includes he who hesitates in front of an unknown, closed door. The wide gap between them punctuated by their palette, he in an anonymous blue, it in a preternatural green. The latter features a pathetic inebriate blissfully unaware of the wine dribbling from his upturned glass and down his front from head to toe, and the lost soul contemplating yet another gulp from whatever poison half-fills his highball glass, the color of which matches his red-distended stomach. These may be harsh observations and impressions, but the men in Anja Sijben’s life also include those who walk and stand with confidence and purpose. The presumed and evident masculine characteristics of duty, hard work and determination are present in traditional occupations and pastimes but so are men who enjoy gardening, camping and music. En toto, these 102 samples are neither Thoreau’s “mass of men leading lives of quiet desperation,” nor are they quite the epic men in Whitman’s “I Sing the Body Electric.” Sijben’s Ideal Man is marked in recognizable contours, yet nuanced in shades of gray and color and best perceived by reading between the lines. Though the ideal may be unattainable, this intuitive process has led the artist to some surprising results. Though the Ideal Man may only be a concept, rooted in the imagination, the Men of Anja Sijben are the latest models of her own holistic self-discovery and creation. It’s a quest she feels good about, and the current sampling speaks well of her journey.